What Day Of The Week Is November 19? 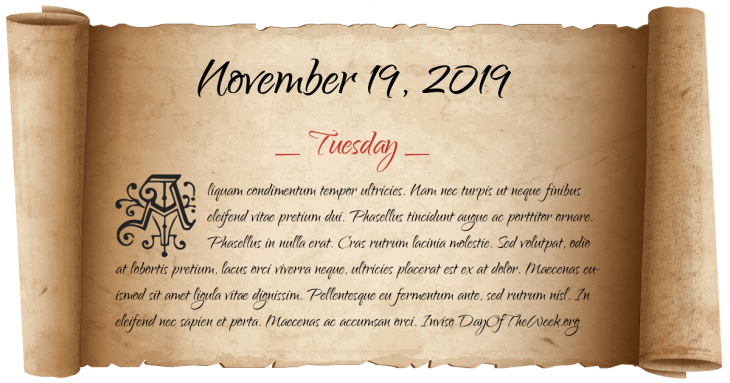 November 19, 2019 is the 323rd day of the year 2019 in the Gregorian calendar. There are 42 days remaining until the end of the year. The day of the week is Tuesday. The Council of Clermont, called by Pope Urban II to discuss sending the First Crusade to the Holy Land, begins. World War II: U.S. President Franklin D. Roosevelt announces the 6th War Loan Drive, aimed at selling US$14 billion in war bonds to help pay for the war effort. San Juanico Disaster: A series of explosions at the PEMEX petroleum storage facility at San Juan Ixhuatepec in Mexico City starts a major fire and kills about 500 people. Lewinsky scandal: The United States House of Representatives Judiciary Committee begins impeachment hearings against U.S. President Bill Clinton. Vincent van Gogh’s Portrait of the Artist Without Beard sells at auction for US$71.5 million. The first of four explosions takes place at the Pike River Mine in New Zealand; 29 people are killed in the nation’s worst mining disaster since 1914.
Who were born on November 19?